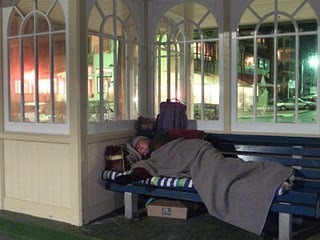 Homelessness is a prevalent problem in the Pensacola area. In 2009, the EscaRosa Coalition for the Homeless reported 713 homeless people in Escambia County and 237 Homeless people in Santa Rosa County. This number was calculated using HUD (U.S. Department of Housing and Development) rules. HUD rules require homeless coalitions nationwide to track homeless people during a 24-hour period in one of the last 10 days in January. Homeless are accounted for by tracking them through tent camps, blood banks, day labor locations, day shelters, food banks and homeless shelters. As far as most people in the homeless services industry believe, this number is far from accurate. HUD has somehow decided that this is the best way to account for the homeless. The article points out a group in the Pensacola area called The Streets and Lanes Ministry. Cathy Harris started this ministry three years ago. The assistance entails about a dozen volunteers who travel around helping the homeless out.